Continuing the series of free Photoshop plugins, Filter Forge, Inc. today released Filter Forge Freepack 3 - Frames for Mac OS X. Also, its flagship product, Filter Forge, is currently available at a time-limited 50% discount. Filter Forge Freepack 3 - Frames includes seven creative frame effects. The theme of the third Filter Forge freepack is frames -- the plugin comprises seven effect filters, each capable of framing any photo in a creative way. 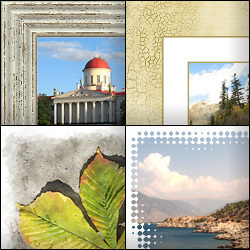 For example, Painting Frame generates realistic wooden frames with paint flaking off; Halftone Frame will frame an image with a pattern of dots of varying size; Simple Frame gives photos a classic elegant feel; Grunge Frame makes a photo look ragged and edgy; and Film Frame produces a black film-like vignette. Filter Forge, Inc. plans to make all existing freepacks available for Mac OS X, and release three more Filter Forge freepacks for both Mac and Windows. Each freepack is centered around a different theme and is based on the technology used in the company's flagship product, Filter Forge, -- an innovative Photoshop plugin allowing users to enjoy over 6700 ready-to-use realistic and abstract textures and effects. Based in Alexandria, VA, Filter Forge, Inc. is a one-product company solely focused on developing Filter Forge, an innovative Photoshop plugin allowing its users to create their own filters.